November Challenge Week 3 » What's Under the Needle? 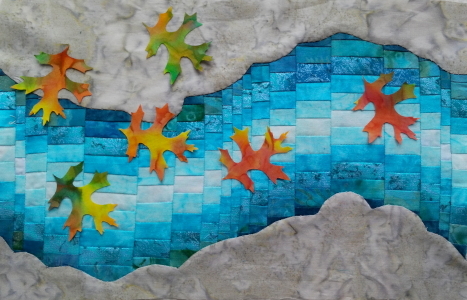 I chose a very colourful fabric so I could make a variety of leaves. 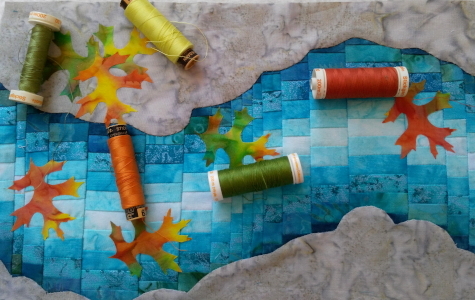 I've made autumn leaves before but they were single coloured so I was a little concerned about how I would match up the right threads to use. 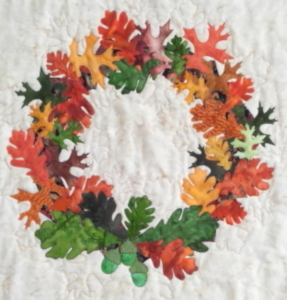 The leaf template I chose (to make things a little easier) was the smallest red oak leaf from Mum's latest pattern, Thanksgiving Wreath. 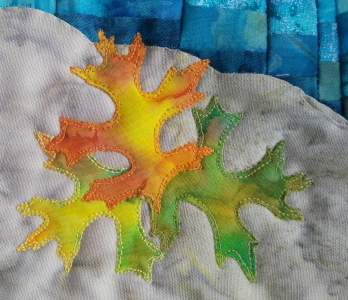 I drew several leaf patterns onto fusible webbing. After pressing them onto the wrong side of the fabric, I cut them out. They were a little fiddly so it took a while. Once done, I removed the backing paper and lay the leaves over the background. 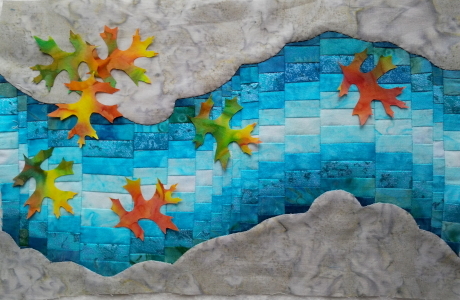 With the paper backing removed, I could easily press the leaves in place when I saw a design I liked best. 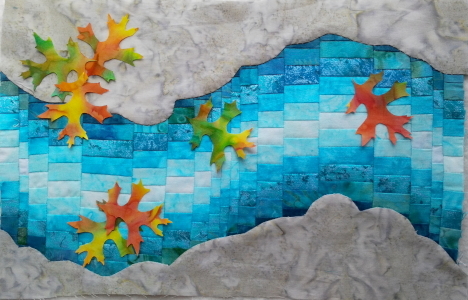 I started with 6 leaves scattered mostly on the water. Then grouped the leaves on the bank a little closer together. 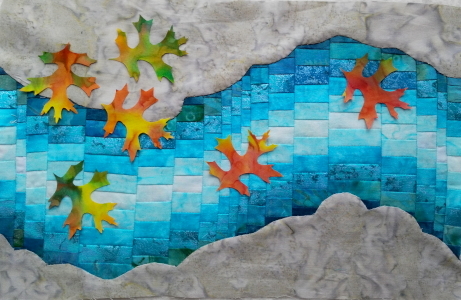 Next, I added a seventh leaf and spread them onto the other bank. I decided they were too scattered so removed these on the opposite bank and spread them down the river more. and liked that idea so grouped another couple in the water area. 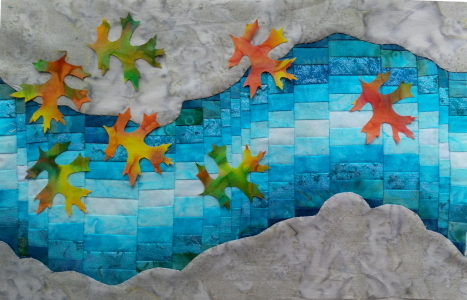 The design I decided on was to group three leaves on the one river bank and have the rest floating away down the river. I decided to make it permanent by pressing all the leaves in place. Next, I rummaged through Mum's threads to see which threads would be suitable to stitch these leaves. Since the leaves varied a lot in color, I chose several. 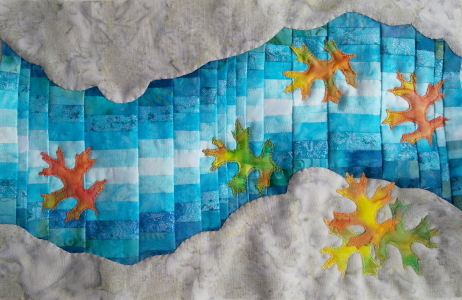 Mum warned me not to press the leaves where the tips were positioned over a seam as it might be difficult to stitch at that delicate point - oops, a bit late for that but something to remember next time. 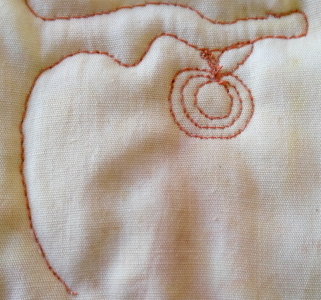 After threading up the sewing machine, dropping the feeds and putting the darning foot on, I set about practicing free-motion. Mum says it's most important to warm up first and even though I was anxious to get started, I heeded her advice. Warming up can be a fun way to create or test designs too! 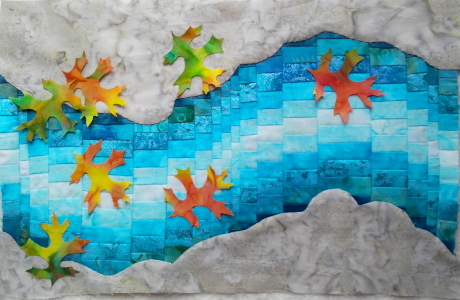 Once I felt confident enough, I set about stitching the leaves in place. 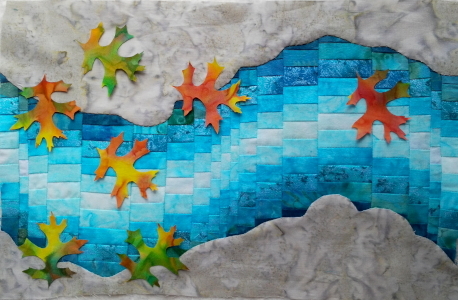 Everything was going wonderfully until I started on the leaves that were over the Bargello section, then I tended to lose momentum as it became difficult to move the quilt easily under the foot, it would get caught and then suddenly move forming a bigger stitch than I wanted. Mum told me that was because of the thickness of all the Bargello seams so I needed to make an adjustment. She had another foot which was higher off the bed of the sewing machine that I tried. It worked and I was able to finish off all the leaves.